ConceptDraw DIAGRAM diagramming and vector drawing software extended with Health Food solution from the Food and Beverage area of ConceptDraw Solution Park perfectly suits for foods design and easy drawing attractive healthy foods and healthy diet illustrations. decorate the plan with professionally designed objects from the Health Food Solution libraries simply dragging them to your document. Another way of drawing in ConceptDraw DIAGRAM is to use as the base the predesigned example or sample from the ConceptDraw STORE. 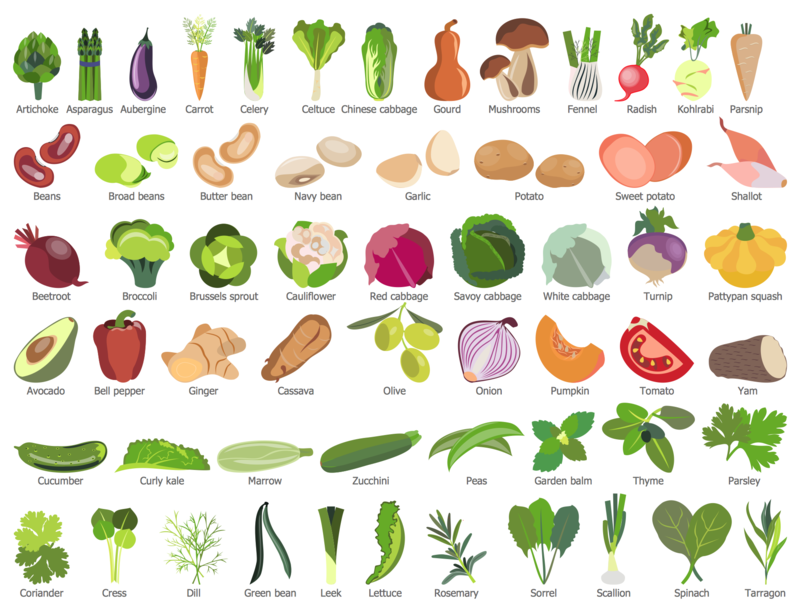 Variety of healthy food ideas are represented on the illustration samples offered by Health Food Solution in ConceptDraw STORE. The healthy diet samples you see on this page were created in ConceptDraw DIAGRAM software using the Health Food Solution. An experienced user spent 10-15 minutes creating each of these samples. Use the tools of Health Food Solution for ConceptDraw DIAGRAM Solution Park to illustrate the images with healthy diet ideas quick, easy and effective. All source documents are vector graphic documents. They are available for reviewing, modifying, or converting to a variety of formats (PDF file, MS PowerPoint, MS Visio, and many other graphic formats) from the ConceptDraw STORE. 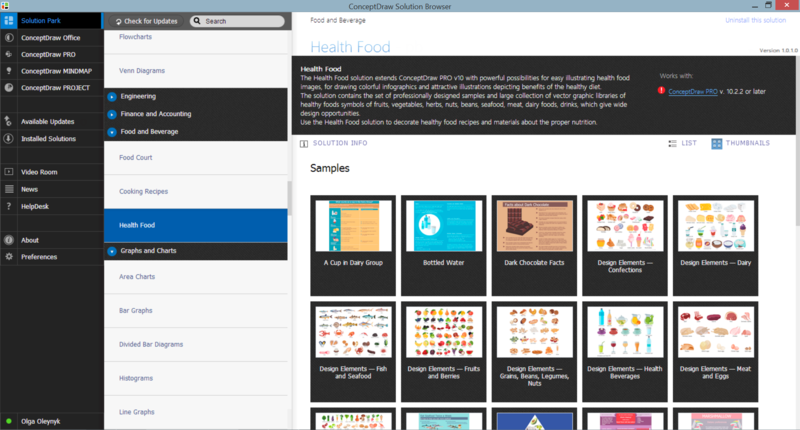 The Health Food Solution is available for all ConceptDraw DIAGRAM users. 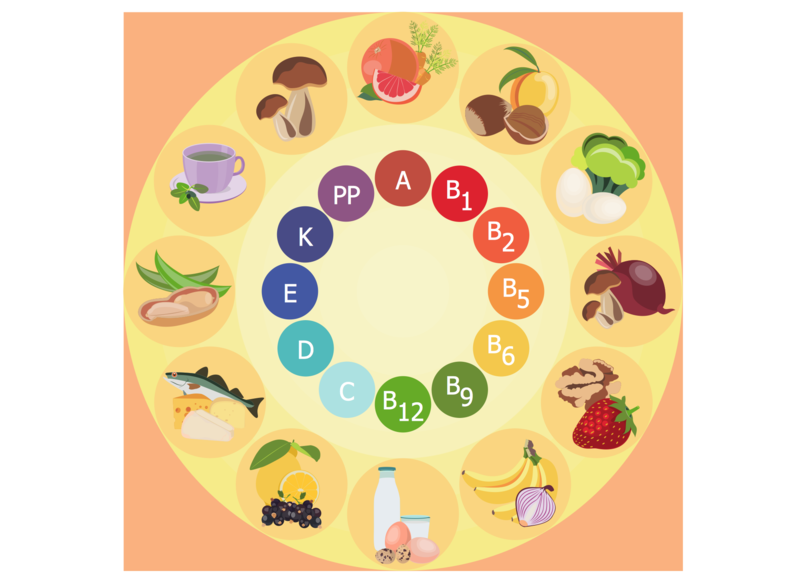 The human organism is so constituted that for a full life you need a wide range of nutrients, minerals and vitamins. To get all this, it is necessary to enrich your nutrition by natural and healthy food. 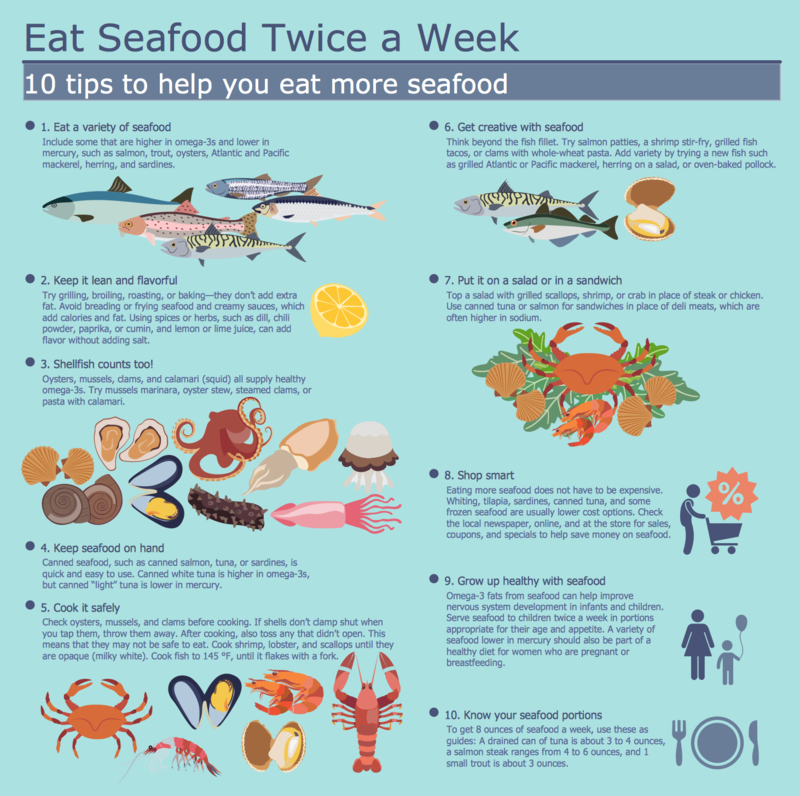 The same microelements and nutrients are contained in different foods, so it is very important to create your own healthy diet plan, based on your preferences and containing the balance of nutrients suitable for you. ConceptDraw DIAGRAM v12 diagramming and vector drawing software extended with Health Food solution from the Food and Beverage area of ConceptDraw Solution Park contains powerful tools for designing healthy diet plan. Representation of healthy food ideas and designing illustrations for healthy food recipes, decoration healthy diet plan and drawing healthy foods images has never been easier than now thanks to the ConceptDraw DIAGRAM v12 diagramming and vector drawing software enhanced with Health Food solution from the Food and Beverage area of ConceptDraw Solution Park.